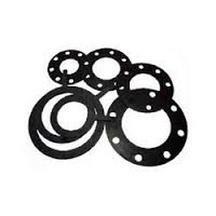 A gasket is a mechanical seal that fills the space between two mating surfaces, generally to prevent leakage from or into the joined objects while under compression. Gaskets save money by allowing "less-than-perfect" mating surfaces on machine parts which can use a gasket to fill irregularities. One of the more desirable properties of an effective gasket in industrial applications for compressed fiber gasket material is the ability to withstand high compressive loads. Most industrial gasket applications involve bolts exerting compression well into the 14 MPa (2000 psi) range or higher.